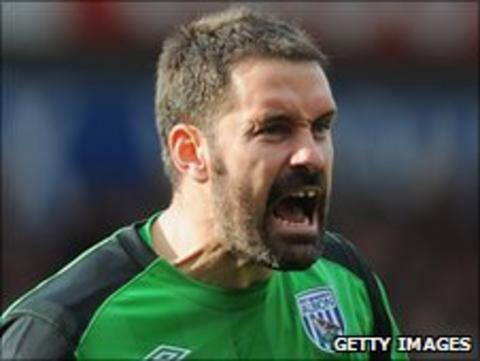 West Bromwich Albion goalkeeper Scott Carson has completed a move to Turkish side Bursaspor for an undisclosed fee. The England international, 25, finalised personal terms on Friday after meeting with club officials earlier in the week. Bursaspor will play in the Europa League next term after coming third in the Turkish top flight. "The place is second to none," Carson told Bursaspor TV. "I'm really excited, it looks like a brilliant club." Bursaspor finished behind Manchester United and Rangers in Champions League Group C last season. "I saw the games against Manchester United and Rangers and they were very good performances," added Carson. "The Europa League is a tough competition but if Bursaspor competed in the Champions League last season then they have a chance of going all the way in the Europa League." Albion manager Roy Hodgson said: "In the three months I worked with Scott I cannot fault his professionalism and dedication. "He has been a good servant to the club and I would like to wish him all the best for the future as he looks to broaden his experience by playing in a foreign country." Carson made 118 appearances after moving to the Hawthorns from Liverpool for £3.25m in July 2008. He won the last of his three England caps in a friendly against Germany in November 2008.